Yoona records her single in today’s episode. Her voice sounds lovely against Sang-soon’s background music and production. He coached her to sing more childlike because he thinks that suits her voice more. I would have to agree. Listening to her sing in that way was like listening to a lullaby. Throwback post of the studio even though Park Bo-gum isn’t at the meenback anymore. I don’t think I have shown a good image of the studio, so I wanted to get one in before this season ends. 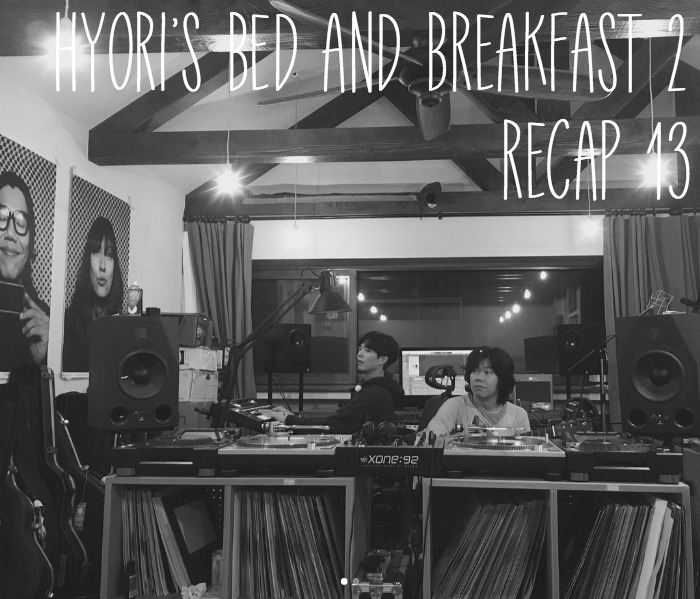 We finally caught up with Hyori’s Bed and Breakfast! Good Lord, with recapping, if you get behind then you get way behind. This post is episode 13, I will post episode 14 later on today. Then, I think there will only be one more episode left for this season right? I think this Sunday’s episode is the final one, though I am not sure about that. We run through images of the last episode and the three guests that showed up. There was a big language barrier with Jackson, but the team worked through it and everyone had a good time. Jackson and Hyori go to the yoga studio. It turns to morning and we see how gorgeous Jeju is. But today’s weather is not that great. It is a windy cold morning. SS is still sleeping. He wakes up and lets the dogs out. The bikers are still sleeping, but the younger one wakes up first. SS gives the cats breakfast. Then he gives the dogs their food. Everyone eats their snacks. SS prepares a morning latte with Gosoonyi watching him closely. he drinks it at the dinner table alone and checks his phone. The bikers come down. SS asks them if it was cold, it was a little chilly last night. The weather forecast says it will be cold and windy and rainy today. The bikers wonder if they will be able to drive. They want to drive to Halla Mountain and drive all the way to 1100 Meters Spot. One of the bikers asks where Jackson is. SS says he went to do yoga. They probably went to the market afterward. Cut to Hyori and Jackson leaving yoga. Jackson says he feels very relaxed. They drink tea in the car and drive off. Jackson asks Hyori what her plans are. She says she will go to the theater with her husband on a date. They don’t go to the movies often, so this is a special day. They get to the spot, Hyori says they are a little bit early. She asks him if he has cash, he only has a card though. Hyori lends Jackson cash, but on the caption, it says you can have credit cards and cash. The market is all closed as they walk through it. Hyori tells Jackson that she likes it, it is a different feeling. Jackson asks if she buys food there and she says sometimes. they find a shop that is open and buy some pants for Jackson. Everyone is all like, wah? You are wearing shorts? He finds some pants but he isn’t sure if they look good. Hyori says warm is better, lol. (I think the pants look good). The wander to the fish market. One of the octopus escapes from the tank and Hyori and Jackson see it. The fisherman grabs it and puts it back inside. Hyori explains everything to him. Hyori wants to make clam pasta so she purchases a lot of clams. She shows him jumbok; Jackson thinks it looks like rocks. But then they share a funny moment when Hyori sheepishly asks Jackson for the money she gave him and he has to fish it out of his pocket. They continue walking around, the market comes to life as they walk around. Someone tells her that she doesn’t look like Hyori. Hyori says it is because she isn’t wearing her makeup. The lady tells her she is still pretty. They both laugh. Hyori tells Jackson that she respects these people because they work here for their entire life in the same spot. She tells Jackson that her father was a barber and used to cut her hair very short. She used to hate it. It was short like Jackson’s hair. But now she thinks it wasn’t so important now that she is older. Jackson asks her if she has had a lot of hairstyles. She says yes, she had yellow, blue, so many different styles. The caption also shows us a lot of Hyori’s different hairstyles through the years. They get back in the car and drive off. Easy by Sky Ferreira plays on the radio. Hyori says she likes the lyrics on this song, especially “I am not happy when I try to fake it.” She sings the song happily, and laughs. Hyori tells Jackson that it is his turn to pick a song. He picks Song Mino. Hyori teaches him how to do a little dance. Then they pick one of Hyori’s old hip-hop songs and laugh as they see how all the clothes and everything are different. Hyori says the song is about how you only need ten minutes to seduce a man. back then ten minute was enough for her, but now it is 2 hours. the caption says it took less than 10 minutes for Jackson. Hyori tells him that she wants to talk deeply with Jackson, but she has reached the limits of her Korean. They start to talk about the meaning of life and how people look happy on SNS but real life is different. It is the same for her. On TV people say that Hyori is pretty with a lot of money and a great husband but that life is impossible to live. Jackso says he can’t imagine how it is to be very famous and feel bad. Hyori agrees, everyone wants to see her pretty side but she doesn’t’ want to show her pretty side all the time. But she is happy that she has a good husband and a few close friends. Jackson things a small number of close friends is better than a lot. Hyori teaches him how to say good friends in Korean. Kunyang Chingu. Jackson asks if he can call her Emo and she is like NOOOOOO! She also doesn’t like noona so she tells him to call her Hyori. They get home. The bikers ask Jackson how it went. He fills him in. SS greats Jackson as well. He thinks Jackson should get some rest, otherwise, he might be too tired. Yoona wakes up and groggily gets out of bed. She slowly walks to the meenbak, but is alarmed at a light that is knocked down by the strong wind. She sets it right. Yoona gets to the house and gets a gift of dduk from Jackson. She is happy to receive it because she loves dduk. Hyori goes back to the room and tries to take a nap, but her doggies missed her so they swarm her and make it hard to sleep. But they finally dig themselves into a cozy nook in different parts of Hyori’s bed and they all go to sleep. The bikers study English a little bit as they sit for tea with SS. They think that anyone that lives here should be very healthy. One of the bikers says that he doesn’t recognize days of time passing while here. The bikers are pretty good friends. The youngest one is a chemical engineer, but he works at a fashion place. His hyung works there and got him a part-time job and he started to like it. his hyung told him not to do it as a permanent job, but the younger person says he liked it so he continued. But the job is demanding so they need to take breaks in nature a lot. Yoona thinks about making breakfast, but everything is yellow. She finds a tomato to add some color to the meal and also finds some green leafy veggies. She starts preparing a breakfast salad. Yoona jokes with SS about buying him popcorn since he bought her a ticket to the movies. They talk about Jackson taking a nap and leaving a little bit for him for when he wakes up. Hyori is sleeping as well so SS and Yoona eat with the bikers. The bikers want to make Yoona a meal since she works all the time. SS says the most delicious food is the one that someone else cooks for them. (The caption jokes that SS looks somewhat sad as Sogili’s house worker). SS tells Jackson that their breakfast is ready. Jackson gets up and eats breakfast alone, but he soon has Mimi for company. Yoona comes in and makes sure Jackson is okay with his breakfast and Hyori comes in at that moment as well. Jackson’s plans are to go to a glass museum because his little sister really likes glass. It is about 30 minutes away. The bikers are getting ready to leave and have all their biker gear on, they say goodbye to everyone and head out. SS goes out too because he wants to hear the engine roar. He also tells Jackson that his taxi is there. The bikers drive off with Jackson and SS waving at them as they leave. Jackson walks out afterward and catches his taxi. Everything is calm at the meenbak now that the guests have all left. The dogs all look at Hyori and sit as if they want her to feed them some of her food. They turn their heads in every which way that Hyori’s hand goes which starts to look like Hyori is conducting an orchestra. So she pretends like she is a maestro. Yoona feeds all the dogs so Hyori can eat in peace. All the dogs are hopping all around her except Gwana, who waits patients on the couch to be fed. Hyori reminds SS that their relationship is winter and we also see a montage of Hyori talking about there winter relationship and going to the movies. Cut to Hyori and SS going upstairs to get ready. Hyori wants SS to dress pretty, she wants him to put on a nice suit jacket. SS starts asking Yoona what clothes look better. hyori is cleaning and is all like, why is he asking Yoona?…..ah, that ajusshi. SS tries on some pants, but they are way too light. He ties his hair up in a funny way which makes Yoona laugh and leave. SS goes downstairs, Hyori laughs and tells him that his pants are way too tight! Why do your hips look like that? She tells him that he looks like a traveling performer. SS runs upstairs and tries on several outfits with Yoona’s coaching. The music from Pretty Woman starts to play as SS goes through all his outfit changes. He finally picks an outfit that works for him. Hyori doesn’t dress yet, she even tries to hide all her clothing choices from SS. Their friends show up. SS greets them, I am Lee Sang-soon from Seoul. They all laugh. Yoona comes down, SS asks them how everything is going upstairs. Yoona says that Hyori noona is back. Upstairs, Hyori tries on a lot of outfits in front of her Mocha. SS leaves first so they can meet up. Yoona asks him what he thinks Hyori will wear. He basically says that he wants her to wear a skirt, but it is in a roundabout way. he leaves and Yoona goes upstairs and tells Hyori that SS wants her to wear a skirt but he thinks she is going to wear a dress. Later, Hyori calls Yoona upstairs and says that she had the best look, Office Lady look. She is dressed like a gorgeous company lady from a fashion house. She also has on some sharp high heels as well. The friends + Hyori drive off and pick up Yoona at her place. We also see SS driving alone, but he has a bouquet of flowers in the backseat. Hyori looks nervous as they drive up. She sees SS and wonders what he has in back of him. She is so embarrassed. She gets out and walks across the street like she is in a romantic comedy. They go inside the movie theater and wait for the others to show up. SS also brought Yoona flowers. But he says he didn’t buy Hyori’s friend anything because she has a husband. They go inside to see the movie, Little Forest. they joke a lot as they buy the popcorn. The flower that SS bought is a forever love flower (Statice). He got Yoona yellow tulips which means the love that is never realized. They both laugh at that. They make it to the theater. Yoona sits all the way in the corner and the friends sit on another corner so that Hyori and SS can have a nice moment alone. Hyori asks Yoona if she wants to sit with them but Yoona smiles knowingly and says she doesn’t want to ruin their date. She does sneak peek some photos of them though. They also sneak peek photos of Yoona as well. They laugh as Yoona smiles at all the kisses Hyori and SS give to each other. They watch the movie. It is a healing movie about living in the country. While watching it, Hyori finishes the popcorn. It looks like SS didn’t even know that Hyori liked popcorn that much. When the movie ends so Hyori and SS head out right away. Hyori walks right up to a palm reading station. She thinks it fits her well. Yoona goes next and also thinks that it works pretty well. SS says that it is pretty cool to watch a movie int he movie theater. Hyori agrees and thinks they should do it more often. Jackson walks around the glass museum. He takes lots of photos and then gets to a glass making area. There is a lot of lost in communication talking between Jackson and the glassmaker. The glassmaker wants him to try it, but Jackson thinks he wants him to watch it. But then a halbae comes into the screen and explains everything in English for Jackson. This halbae knows English very well and coaches Jackson in making glass with the other glass maker also helping him out. It looks really cool. Jackson thanks the man a lot when he leaves. They shake hands and the man tells him to have a good journey. Now we get to see the bikers riding up the mountain. It is a beautiful sight, but it also looks very dangerous because it is a wet day out. They get to the top of the mountain, but it is way too foggy to see anything. They are supposed to see the sea, but they don’t see anything. They are light-hearted about it though and make plans to do something else. Down the mountain, they go. Cut to the bikers at a grocery store. They want to treat the meenbak people with food. The youngest one calls his mother to ask how to make 5-6 servings of goldenwah. They both laugh about going to the grocery store instead of the traditional farmers market because they aren’t good at making deals. On the way home, Yoona asks if she has ever gotten flowers from SS. She says it is the first time. But SS says they didn’t need flowers because she is the flower. SS also tells Yoona about the one-sided love meaning of the tulips. Yoona busts out laughing. SS tells her to give up and Hyori is all like, so Yoona should give up but you shouldn’t give up? Hyori gets a text that says the bikers will be back around 5 pm. Hyori says it feels more like family since they only have three people there not. Once home, they put their super relaxing clothing back on and do all the housework like folding clothes and mopping the floor. The bikers get back and head upstairs to take a shower. Hyori and SS go downstairs. There is a funny moment when Midal hops up on the windowsill and tries to eat the cat’s food. He doesn’t make it though, and is kind of stuck with his front paws on the window sill but his back paws are hanging precariously off. SS has to help a doggie out and lifts him onto the windowsill. The three meenbak staff sit at the table. Hyori starts to read a poem while SS plays music to it. Hyori says thinking about everyone very sensibly, if you live in a group with everyone together then you will understand everyone. Yoona agrees, then they will feel more relaxed. They think it would be nice to live in the world like this. Hyori also wrote a poem, she asks Yoona if she wants to hear it. She asks SS to play the guitar when she sings it. This is their poem reading day. Can you say it is not a miracle? Yoona tells her she was about to cry again. They both laugh. Hyori says she wrote that poem thinking about dogs. People think they are just animals, but we think they are our family. We sleep together and eat together. The bikers start to make dinner. They wash their hands and get to work. The youngest one tells Yoona that the recipe is from his mother. They grow serious as they work. …look at the sky….close your eyes a little bit….hold your hand out….read the book, not the camera, no emotion! Good! Jackson comes back and walks up the cold wet lane back to the house. When he gets inside they comment on the weather and on his day. He tells them that he got to make glass. he also went to the beach and ran on it. Hyori checks the food in the kitchen, it looks good. She says it will taste better with some herbs. They all dress the table and sit to enjoy the food. Everything looks mouthwatering good. They also drink makgoli with all this food. One of the bikers says that he is more nervous than on check-in day. Everyone eats it and says that it tastes good. They wonder if it is too spicy for Jackson. The biker said he added fewer pepper flakes for Jackson. The food finishes with everyone eating everything. The bikers go to clean but Yoona tells them that you don’t have to clean when you cook. Jackson helps clean though. Yoona tells Jackson to lacerate the leftover food, but Jackson thought she said to leave, so he is thoroughly confused. He decides to go outside and separate the recycling. Then he goes back inside and asks to help. Yoona and Jackson have a bit of small talk about Yoona working hard and getting paid. then they talk about all the people that write on the board. Hyori helps Jackson read the board. Jackson can read well, but he doesn’t’ understand. Then he reads what the little kid wrote but it doesn’t make much sense. The adults also have a hard time explaining what the little kid wrote. Yoona goes to the studio to sing the song she prepared. We see a little flashback of Yoona writing her lyrics for Hyori’s song. Inside the studio, Yoona thinks it is so strange that they can do everything at home (record everything). SS sets up the mic for Yoona. He tells her to sing from the beginning. SS starts playing the song and signals to Yoona to start singing. SS stops and says it is really cool. He tells Hyori that it is really cool. Yoona says she feels strange in a low key. Yoona wants to use a fake voice but SS wants her to sing it comfortably with no singing technique, just like a little kid. Flashback to Yoona explaining the memories she wants to share in her lyrics. Hyori tells her that she is good at singing, it is difficult to sing cleanly like that. Yoona leaves and runs back to the meenbak. The guys are happily all talking together with Soonyi giving Jackson a back massage. Yoona says Soonyi never did that with her. She sits and talks with them. Soonyi also gives Jackson a leg massage. Yoona asks SS why they do that, when he comes in and he says it is because they like Jackson. SS walks Yoona out and tells her all the plans for the song. All the cats are with Jackson and sleep in his bed tiny bedroom with him. The bikers sleep upstairs and the owners go to sleep in the studio. SS and Hyori tell each other that they were cool today. Hyori tells SS that he was soleda (heart fluttering) today. Hyori has a photo shoot in Jeju.